Cross-party talks are continuing in Whitehall, amid parliamentary deadlock over Theresa May's Brexit deal. So what are the sticking points and can Labour and the Conservatives reach an agreementBehind the scenes, the prospect of a deal, while difficult, is not impossible.There is a big incentive for both sides to reach agreement: the avoidance of next month's European elections. Prime Minister Theresa May doesn't want to give a platform to parties such as Nigel Farage's new project which could appeal to Brexit-voting Conservatives. And, frankly, some of her own activists would be conflicted over how, or whether, to vote.For Labour leader Jeremy Corbyn, awkward questions about a second referendum could be ducked if there is no election campaign.So the talks are serious and not just political window dressing, and the fact that Mr Corbyn and Mrs May met on Thursday is significant. 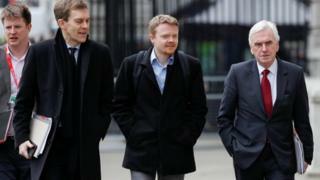 The Labour leader's policy guru Andrew Fisher joined shadow chancellor John McDonnell for the cross-party talks on Friday.But, as I understand it, significant hurdles remain. Some of the detail of possible changes to the Political Declaration - the blueprint for the UK's post-Brexit relationship with the EU - is being discussed.But sequencing is a problem.Labour wants to discuss legally binding changes to the document, future-proofing it, where possible, against a change of Conservative leader.Broadly speaking, the government would rather do "the easy bit" first - discussing legislation to protect workers' rights.Resolving this tension is key to a deal.Labour is also keen to secure agreement on a customs union. It is flexible on what it would be called - an "arrangement", for example - and Mrs May hinted on Thursday that the two sides were close on this.But they are not yet close enough. The definition of what a customs union/arrangement does is vital to the Labour side.But the main constraints to a deal may come from Mrs May and Mr Corbyn's parties, rather than their negotiators. If there is too much compromise on a customs union, Mrs May risks losing more cabinet ministers.For Mr Corbyn, the pressure from many Labour members is for him to exact a referendum, in return for passing the deal.So far, the prime minister isn't budging on this.One way round this obstacle would be to hold a separate vote in Parliament on a referendum, possibly as an amendment to the forthcoming Withdrawal Agreement Bill.Both Mrs May and Mr Corbyn - who is not an enthusiast for a public vote - believe this would fall.But some of the Labour leader's shadow ministers - including some who are firmly on the Left - are pushing for a referendum, or confirmatory ballot, to be tied explicitly to any Brexit deal.So, getting a deal passed would be totally dependent on approving a public vote at the same time.I am told shadow Brexit secretary Sir Keir Starmer is pressing for a ballot to be part of any final package.If, in the end, these difficulties can't be overcome then the hope is that both sides will at least agree a parliamentary process for discussing and voting on options which might finally break the deadlock.